DIE Martis, videlicet, primo die Maii. Thanks to the Preachers at the Fast. L. Willough by to attend. Letter and Declaration from the King. Sir J. Greenvill thanked for bringing them. Message to them, for the E. of Manchester to be a Commissioner of the Great Seal. Long's Petition for the Records in Chancery. King's Letter, &c. to be printed. L. Wharton, Leave to be absent. Committee to consider of an Answer to the King's Letter, &c.
Message to H. C. to do so. Message from thence, about the Conference. Conference about settling the Nation; and considering of an Answer to the King's Letter, &c.
Comes Manchester, Speaker pro Tempore. Viscount Conway. Ds. De la Warr. ORDERED, That this House gives Dr. Reynolds and Mr. Hardy Thanks, for their Pains in Preaching Yesterday before the Lords, at the Fast; and that they be desired to print and publish their Sermons. The House being informed, "That the Lord Willoughby of Parham is ready to attend this House:"
Their Lordships ORDERED, That a Letter shall be written to him, to desire him to give his Attendance on this House as a Peer. Any Four; to meet every Saturday in the Afternoon. ORDERED, That the Lord Chief Baron of the Exchequer and the Master of the Rolls have Notice to give their Attendance on this House, as Assistants. ORDERED, That this House shall be called on Thursday next. The House being informed, "That there was a Gentleman, Sir John Greenvill, in the Lobby, and had a Letter to deliver to this House from the King:"
The House thereupon was adjourned during Pleasure; and the Speaker was appointed to go to the Lower End of this House, and receive it at the Hands of the Messenger. The Speaker reported, "That Sir John Greenvill delivered to him a Letter, which he said he received from the King his Master, to deliver to the House of Peers." "To the Speaker of the House of Peers, and to the Lords there assembled. "Right Trusty and Right Well-beloved Cousins, and Right Trusty and Well-beloved Cousins, and Trusty and Right Well-beloved, We greet you well. We cannot have a better Reason to promise Ourself an End of Our common Sufferings and Calamities, and that Our own just Power and Authority will with God's Blessing be restored' to Us, than that We hear you are again acknowledged to have that Authority and Jurisdiction which hath always belonged to you, by your Birth and the fundamental Laws of the Land: And We have thought it very fit and safe for Us to call to you, for your Help, in the composing the confounding Distempers and Distractions of the Kingdom, in which, your Sufferings are next to those We have undergone Ourself; and therefore you cannot but be the most proper Counsellors for removing those Mischiefs, and for preventing the like for the future. How great a Trust We repose in you, for the procuring and establishing a blessed Peace and Security for the Kingdom, will appear to you by Our inclosed Declaration; which Trust, We are most confident, you will discharge with that Justice and Wisdom that becomes you, and must always be expected from you; and that, upon your Experience how One Violation succeeds another when the known Relations and Rules of Justice are once transgressed, you will be as jealous for the Rights of the Crown, and for the Honour of your King, as for yourselves; and then you cannot but discharge your Trust with good Success, and provide for and establish the Peace, Happiness, and Honour, of King, Lords, and Commons, upon that Foundation which can only support it; and we shall be all happy in each other. And as the whole Kingdom will bless God for you all, so We shall hold Ourself obliged in an especial Manner to thank you in particular, according to the Affection you shall express towards Us. We need the less enlarge to you upon this Subject, because We have likewise writ to the House of Commons, which, We suppose, they will communicate to you. And We pray God to bless your joint Endeavours for the Good of us all. And so We bid you very heartily Farewell. "Given at Our Court at Breda, this Day of April, 1660, in the Twelfth Year of Our Reign. "Charles, by the Grace of God, King of England, Scotland, France, and Ireland, Defender of the Faith, &c. To all Our Loving Subjects, of what Degree or Quality soever, Greeting. If the general Distraction and Confusion which is spread over the whole Kingdom doth not awaken all Men to a Desire and Longing, that those Wounds, which have so many Years together been kept bleeding, may be bound up; all We can say will be to no Purpose: However, after this long Silence, We have thought it Our Duty to declare how much We desire to contribute thereunto; and that, as We can never give over the Hope in good Time to obtain the Possession of that Right which God and Nature hath made Our Due; so We do make it Our Daily Suit to the Divine Providence, that He will, in Compassion to Us and Our Subjects, after so long Misery and Sufferings, remit and put Us into a quiet and peaceable Possession of that Our Right, with as little Blood and Damage to Our People as is possible. Nor do We desire more to enjoy what is Ours, than that all Our Subjects may enjoy what by Law is theirs, by a full and entire Administration of Justice throughout the Land, and by extending Our Mercy where it is wanted and deserved. "And to the End that the Fear of Punishment may not engage any, conscious to themselves of what is passed, to a Perseverance in Guilt for the future, by opposing the Quiet and Happiness of their Country, in the Restoration both of King, Peers, and People, to their just, ancient, and fundamental Rights: We do by these Presents declare, That We do grant a free and general Pardon, which We are ready upon Demand to pass under our Great Seal of England, to all Our Subjects, of what Degree or Quality soever, who, within Forty Days after the Publishing hereof, shall lay Hold upon this Our Grace and Favour, and shall by any Public Act declare their doing so; and that they return to the Loyalty and Obedience of good Subjects (excepting only such Persons as shall hereafter be excepted by Parliament). 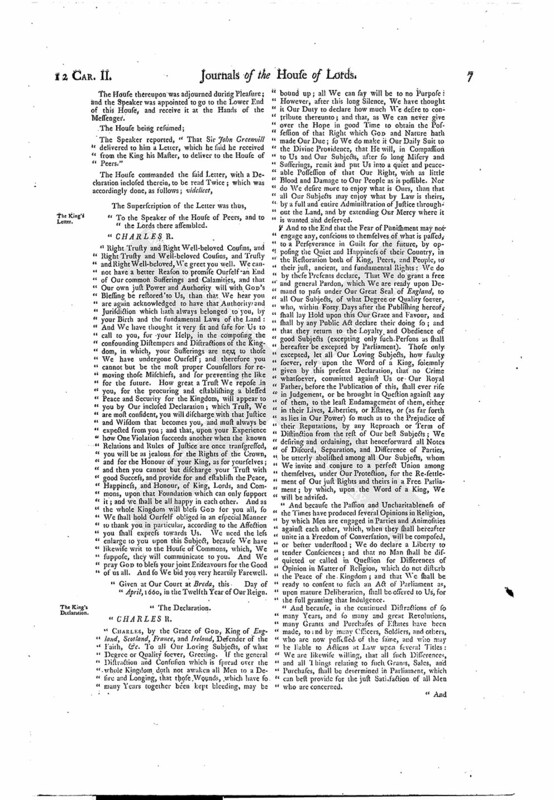 Those only excepted, let all Our Loving Subjects, how faulty soever, rely upon the Word of a King, solemnly given by this present Declaration, that no Crime whatsoever, committed against Us or Our Royal Father, before the Publication of this, shall ever rise in Judgement, or be brought in Question against any of them, to the least Endamagement of them, either in their Lives, Liberties, or Estates, or (as far forth as lies in Our Power) so much as to the Prejudice of their Reputations, by any Reproach or Term of Distinction from the rest of Our best Subjects; We desiring and ordaining, that henceforward all Notes of Discord, Separation, and Difference of Parties, be utterly abolished among all Our Subjects, whom We invite and conjure to a perfect Union among themselves, under Our Protection, for the Re-settlement of Our just Rights and theirs in a Free Parliament; by which, upon the Word of a King, We will be advised. "And because the Passion and Uncharitableness of the Times have produced several Opinions in Religion, by which Men are engaged in Parties and Animosities against each other, which, when they shall hereafter unite in a Freedom of Conversation, will be composed, or better understood; We do declare a Liberty to tender Consciences; and that no Man shall be disquicted or called in Question for Differences of Opinion in Matter of Religion, which do not disturb the Peace of the Kingdom; and that We shall be ready to consent to such an Act of Parliament as, upon mature Deliberation, shall be offered to Us, for the full granting that Indulgence. "And because, in the continued Distractions of so many Years, and so many and great Revolutions, many Grants and Purchases of Estates have been made, to and by many Officers, Soldiers, and others, who are now possessed of the same, and who may be liable to Actions at Law upon several Titles: We are likewise willing, that all such Differences, and all Things relating to such Grants, Sales, and Purchases, shall be determined in Parliament, which can best provide for the just Satisfaction of all Men who are concerned. 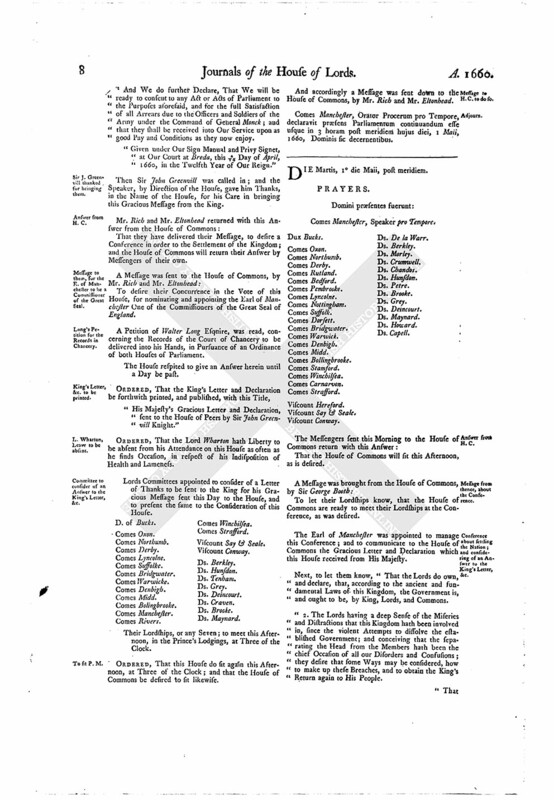 And We do further Declare, That We will be ready to consent to any Act or Acts of Parliament to the Purposes asoresaid, and for the full Satisfaction of all Arrears due to the Officers and Soldiers of the Army under the Command of General Monck; and that they shall be received into Our Service upon as good Pay and Conditions as they now enjoy. Given under Our Sign Manual and Privy Signet, at Our Court at Breda, this 4/14 Day of April, 1660, in the Twelfth Year of Our Reign." Then Sir John Greenvill was called in; and the Speaker, by Direction of the House, gave him Thanks, in the Name of the House, for his Care in bringing this Gracious Message from the King. That they have delivered their Message, to desire a Conference in order to the Settlement of the Kingdom; and the House of Commons will return their Answer by Messengers of their own. To desire their Concurrence in the Vote of this House, for nominating and appointing the Earl of Manchester One of the Commissioners of the Great Seal of England. 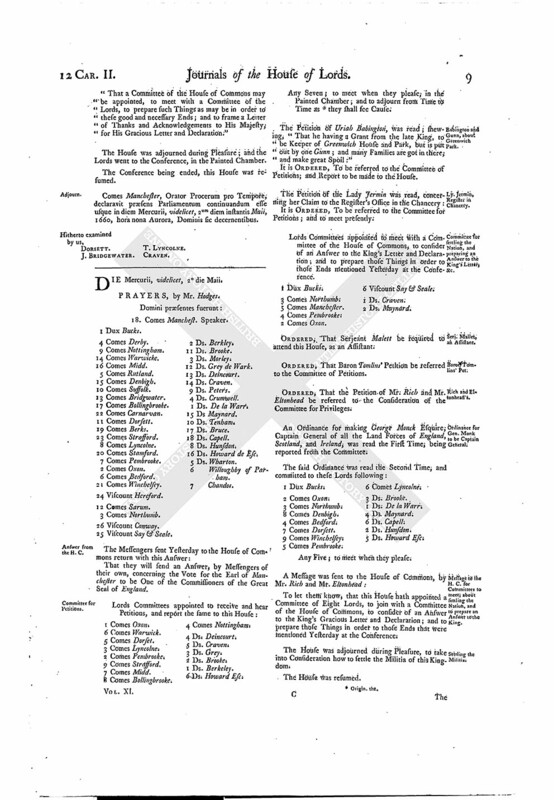 A Petition of Walter Long Esquire, was read, concerning the Records of the Court of Chancery to be delivered into his Hands, in Pursuance of an Ordinance of both Houses of Parliament. The House respited to give an Answer herein until a Day be past. "His Majesty's Gracious Letter and Declaration, sent to the House of Peers by Sir John Greenvill Knight." ORDERED, That the Lord Wharton hath Liberty to be absent from his Attendance on this House as often as he finds Occasion, in respect of his Indisposition of Health and Lameness. Lords Committees appointed to consider of a Letter of Thanks to be sent to the King for his Gracious Message sent this Day to the House, and to present the same to the Consideration of this House. Their Lordships, or any Seven; to meet this Afternoon, in the Prince's Lodgings, at Three of the Clock. ORDERED, That this House do sit again this Afternoon, at Three of the Clock; and that the House of Commons be desired to sit likewise. And accordingly a Message was sent down to the House of Commons, by Mr. Rich and Mr. Eltonhead. Comes Manchester, Orator Procerum pro Tempore, declaravit præsens Parliamentum continuandum esse usque in 3 horam post meridiem hujus diei, 1 Maii, 1660, Dominis sic decernentibus. That the House of Commons will sit this Afternoon, as is desired. To let their Lordships know, that the House of Commons are ready to meet their Lordships at the Conference, as was desired. The Earl of Manchester was appointed to manage this Conference; and to communicate to the House of Commons the Gracious Letter and Declaration which this House received from His Majesty. Next, to let them know, "That the Lords do own, and declare, that, according to the ancient and fundamental Laws of this Kingdom, the Government is, and ought to be, by King, Lords, and Commons. 2. The Lords having a deep Sense of the Miseries and Distractions that this Kingdom hath been involved in, since the violent Attempts to dissolve the established Government; and conceiving that the separating the Head from the Members hath been the chief Occasion of all our Disorders and Confusions; they desire that some Ways may be considered, how to make up these Breaches, and to obtain the King's Return again to His People. "That a Committee of the House of Commons may be appointed, to meet with a Committee of the Lords, to prepare such Things as may be in order to these good and necessary Ends; and to frame a Letter of Thanks and Acknowledgements to His Majesty, for His Gracious Letter and Declaration." The House was adjourned during Pleasure; and the Lords went to the Conference, in the Painted Chamber. The Conference being ended, this House was resumed. 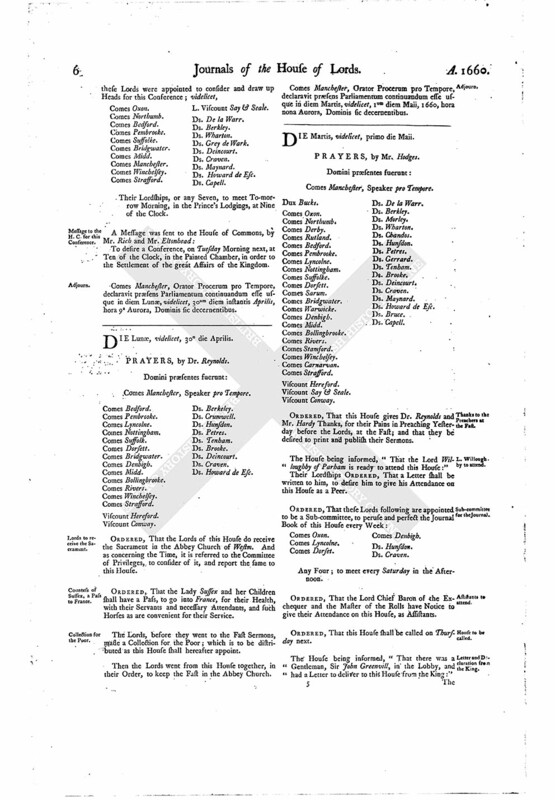 Comes Manchester, Orator Procerum pro Tempore, declaravit præsens Parliamentum continuandum esse usque in diem Mercurii, videlicet, 2um diem instantis Maii, 1660, hora nona Aurora, Dominis sic decernentibus.